Pick up from the hotel and drive to Tiwanaku in private transport (minibus). The journey lasts about 1 hour and 45 minutes. 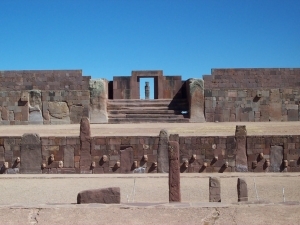 Tiwanaku is one of the most important archaeological sites in Bolivia. We visit the region’s museum, the Kalasasaya temple, the famous ‘Puerta del Sol’, then we have lunch before visiting the enigmatic ruins of Pumapunku. 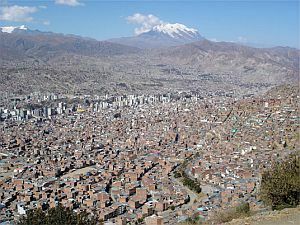 Then we drive back to La Paz for a 3 hour private city tour (in a minibus), seeing the most important sights of the city, such as the Moon Valley, Plaza Murillo, the museums on Calle Jaen, craft markets, etc. Pick up from the hotel in the morning in shared tourist bus to Copacabana. This journey takes about 3 ½ hours. On arrival in Copacabana we visit the Cathedral and then have lunch. After lunch we go on a prívate boat trip (shared trips are optional) to the southern part of the Island of the Sun called Pilcocaina to visit the Palace of Pilcocaina, which are Inca archaeological ruins. 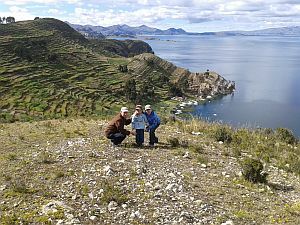 Afterwards it is about a 45 minute walk to our hotel with amazing scenery of the Andean Cordillera Real mountain range, and the majestic Lake Titicaca, which is the highest navigable lake in the world (3850 mts above sea level). We have dinner at the hotel and rest. 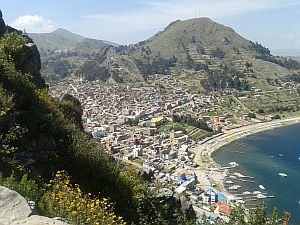 After breakfast we walk back to the harbour passing the steps of Yumani and the Fountain of Youth, which are also Inca ruins. Then we return to Copacabana by boat, arriving at midday for lunch. We return to La Paz on the tourist bus to spend the night in La Paz. Tourist bus La Paz – Copacabana – La Paz, private or public transport to the Island of the Sun. Entrance fees to all tourism sites. All meals in Copacabana and on Island of the Sun, lunch in Tiwanaku. Night accomodations in 3 Star hotels or 3 Star hostels (on the Island of the Sun in an Eco-Lodge) – in double rooms with private bathroom and breakfast. English speaking guide for the city tour,Tiwanaku, Copacabana + Island of the Sun.